This May, in celebration of APIA Heritage Month, we have asked several respected teachers and writers of Asian American poetry to share writing exercises with us in lieu of our regular Friday Prompts. This week’s installment was contributed by Karen An-hwei Lee. When the Santa Ana comes, the sun looms closer to the earth despite the winter solstice. Noon hangs, a sharp, angular hour, in the sky. Eucalyptuses toss dry leaves onto the asphalt, and no one sweeps them: no use. No one picks up broken pottery shards. Let the wind sweep everything clean, “for the wind blows wherever it pleases,” says Jesus to Nicodemus. “You hear its sound, but you cannot tell where it comes from or where it is going. So it is with everyone who is born of the Spirit” (John 3:8). After prayer, I close the shades, stay in the coolest room away from the lanai. What is the tone of this wind? It is a desert wind, not a hurricane gale or a blizzard. As a girl, spending my childhood on an archipelago and two New England coasts, I experienced both of the latter. With the Santa Ana wind, tar paper tumbles in the road. I set out dishes to dry; a teaspoon of water vanishes. Night yields little relief as sea waves swell to the west. To the east, helicopters fly over spot fires in the hills and canyons where rough chaparral brush—yucca, black sage, manzanita—has weathered pre-blackened zones of controlled burning. After moving to California, I learned two things. With an earthquake, temblor-raised dust seeds the clouds, sending rain. After the Santa Ana calms, a fog always rolls in. I still do not know whether this is a sea fog or a land fog. On the coast, we have a phenomenon called a marine layer, so perhaps that is what this is. The temperature drops from the nineties to the seventies and even to the forties after sundown. I walk in the fog with my hair unbound and a fresh skirt, carrying mailed books in the welcome cool. Following a week of fire and smoke, I am grateful for the fog as a divine provision. Prompt: Consider the rhythm of a wind you know well and write in this rhythm. 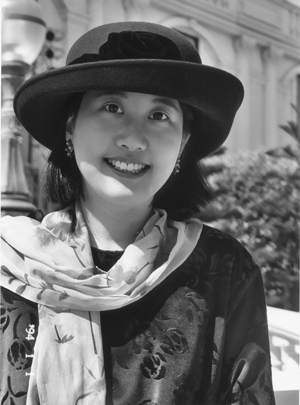 Karen An-hwei Lee is the author of Phyla of Joy (Tupelo 2012), Ardor (Tupelo 2008) and In Medias Res (Sarabande 2004), which won the Norma Farber First Book Award. The recipient of a National Endowment for the Arts Grant, she lives and teaches in southern California, where she is a novice harpist. She earned an M.F.A. from Brown University and a Ph.D. in English from the University of California, Berkeley.